You are here: Home / HVAC / How HVAC Chiller Works & Why It’s Perfect For Summer! How HVAC Chiller Works & Why It’s Perfect For Summer! Everyone enjoys cool beverages and cool air during the summer, and an HVAC chiller can give you both! Read this article to learn exactly how HVAC chiller works! As you wait for the hot summer months with anticipation, you’re probably getting your AC unit in top shape. But how you ever wondered how HVAC chiller works and why it’s important? If you haven’t, this articles will help you learn how. Read on for more. The purpose of chillers, whether they’re industrial or HVAC, is to move heat from one location and transport it to another place to chill. Chillers tend to use either water or another type of liquid to process it through the piece of equipment they’re trying to chill. The pumping mechanism in chillers process the water or glycol solution and transfers it to a pumping system to cool the area desired. Chillers serve to cool a variety of products, not just HVAC units. They’re used to chill products, machinery, water chillers, injection molding, food and beverage industry, and many others. 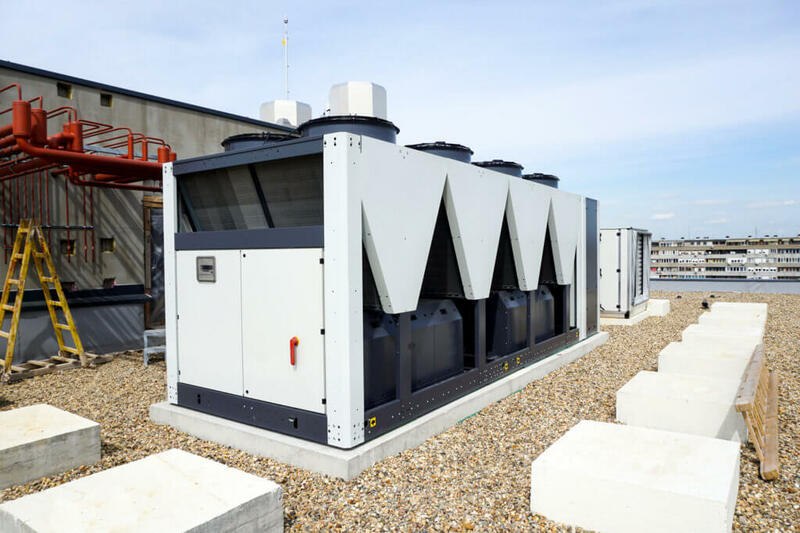 What are the HVAC Chiller Components? Most HVAC chillers consist of four components: a compressor, evaporator, condenser, and thermal expansion valve. Compressor: Most HVAC compressors use a piston-operated vapor pump that works by means of an electric motor. Evaporator: The purpose of the evaporator is to move the heat from the water on the outside to get cool on the inside by the chiller components. Condenser: The condenser transfers the heat once it has passed through the refrigerant to cool the outside of the system. Thermal expansion valve (refrigerant metering device): This valve is in charge of the flow and pressure of the refrigerant coolant. The HVAC chiller works by changing the physical form of the refrigerant to move the heat from one place to the other. During the process, the chiller turns from liquid to gas and once it releases heat it returns to a liquid stage. Compressor > Condenser: Firstm the compressor pumps the hot liquid or refrigerant to the condenser. Then, the refrigerant moves to the cold water located on the outside of the component. Condenser > Metering Device: The liquid flows through the metering device where the flow will be moderated. The liquid refrigerant should drop its pressure to reduce its boiling point. In this stage, the liquid turns into gas. Metering Device > Evaporator: The next stage of the gas is to turn into vapor. As it turns into vapor, the refrigerant absorbs the heat from the outside of the chiller to cool the area surrounding it. Evaporator > Compressor: Now the warm gas moves from the evaporator to the compressor. In the compressor, the temperature and pressure hear the gas once more. The refrigerant then travels to the condenser and releases the heat, and the cycle begins again. You enjoy the cool air of your HVAC unit during the hot summer months, but now you know how it works. If you’re having problems with your HVAC chiller, you might need AC repair service. Contact us to schedule service with Eyman.